Travel PR News | Hilton rolls out its Connected Room technology at more hotels across the U.S.
Hilton rolls out its Connected Room technology at more hotels across the U.S.
MCLEAN, Va., 2018-Apr-27 — /Travel PR News/ — The list of benefits Hilton guests can get from the Hilton Honors app to personalize their stays just got longer. The app will now be able to turn guests’ mobile phones into an in-room remote for television entertainment, lighting, and temperature control as part of Hilton’s rollout of its Connected Room technology at hotels across the U.S. this year. The award-winning Hilton Honors app has already been making guests’ lives easier by enabling them to control and personalize various aspects of their stay. Hilton Honors members have been using the app to check in, select their room, and open the door with Digital Key — a Smartphone feature now available in more than 3,000 Hilton hotels and used to open more than 22 million room doors to date. Hilton Honors membership and the app are both free and available to all Hilton guests. Hilton’s launch of Connected Room and the integrated technology continues a 100-year history of innovating in the hotel industry. In addition to introducing the first airport hotel and central reservations system, Hilton was the first to provide in-room TVs and has also been a food and beverage pioneer, inventing such iconic staples as the piña colada. Operating within a culture of creativity, Hilton continues to deliver on its commitment to provide exceptional experiences — every hotel, every guest, every time. Hilton (NYSE: HLT) is a leading global hospitality company, with a portfolio of 14 world-class brands comprising more than 5,300 properties with more than 863,000 rooms, in 106 countries and territories. Hilton is dedicated to fulfilling its mission to be the world’s most hospitable company by delivering exceptional experiences – every hotel, every guest, every time. The company’s portfolio includes Hilton Hotels & Resorts, Waldorf Astoria Hotels & Resorts, Conrad Hotels & Resorts, Canopy by Hilton, Curio Collection by Hilton, DoubleTree by Hilton, Tapestry Collection by Hilton, Embassy Suites by Hilton, Hilton Garden Inn, Hampton by Hilton, Tru by Hilton, Homewood Suites by Hilton, Home2 Suites by Hilton and Hilton Grand Vacations. The company also manages an award-winning customer loyalty program, Hilton Honors. Hilton Honors members who book directly through preferred Hilton channels have access to instant benefits, including a flexible payment slider that allows members to choose exactly how many Points to combine with money, an exclusive member discount that can’t be found anywhere else, and free standard Wi-Fi. Visit newsroom.hilton.com for more information and connect with Hilton on Facebook, Twitter, LinkedIn, Instagram, and YouTube. 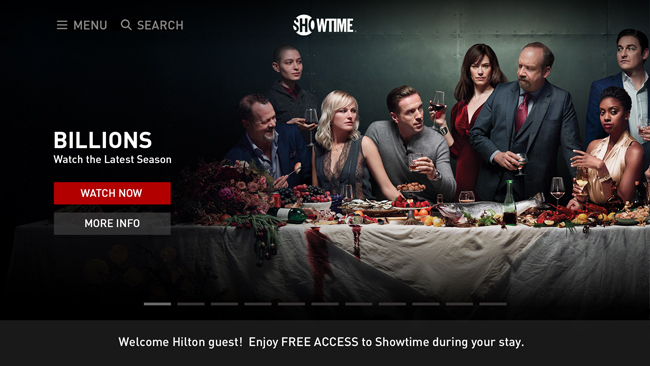 This entry was posted in Entertainment, Hospitality, Hotels, Travel, Travel Marketing, Travel Services, Travel Tech, Travelers and tagged Connected Room technology, Hilton, Jon Witter, Julia Quinn. Bookmark the permalink.